Calista Schechinger, Sadie Varhall, and Christie Ambrosi traveled to Italy in July as part of America’s Team, an 18-and-under softball team, to generate support in reinstating softball as an Olympic sport. Ambrosi, a 2000 Olympic gold medalist, graduated from Blue Valley Northwest and conducts softball clinics for Blue Valley Recreation. The girls have a deeper connection – they played against each other in Blue Valley Rec’s league and both have a parent with ties to the organization. Schechinger is the daughter of Blue Valley Rec’s gymnastics coordinator, Angie, and Varhall’s mother, Stacy Obringer-Varhall, is the Blue Valley School Board’s liaison to the Commission. Ambrosi selected a team of 10 players who represented the United States on a three city tour in Milan, Florence, and Rome. The girls were selected not only for their softball abilities, but for their reputations as positive role models in the community. The nine-day trip featured three doubleheaders with Italian teams. Some games pitted the two countries against each other while other games featured players from both squads on the same side. The focus was similar to what the girls experienced during their days with Blue Valley Rec. The team also explored the country, visiting the cities of Lake Como, Pisa, and Orvieto. Day trips were also taken to famous Italian landmarks - the Colosseum, the Pantheon, St. Peter’s Basilica, and the Leaning Tower of Pisa. It was as much a life experience as it was an athletic one. “It was an amazing learning experience for the girls to see another culture and interact with the Italian players,” said Obringer-Varhall. Ambrosi is one of several Olympians and college players/coaches taking teams overseas in an attempt to gain exposure. Team USA won three gold medals in softball – 1996 in Atlanta, 2000 in Sydney, and 2004 in Athens – before the sport was declassified as an Olympic sport in 2005 along with baseball. 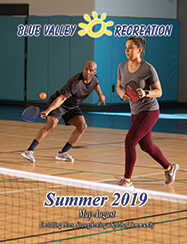 Ambrosi vowed to continue her efforts when she is not conducting camps and clinics for Blue Valley Rec.